Catching up on a lot of good writing news while getting ready to head to San Diego for the Southern California Writers Conference – always a great weekend of fun, frivolity, and connection with other authors, editors, agents and publishers. Last week, author Martha Halda and I were interviewed on Jennifer Hillman’s Abstract Illusions Radio show. Each of us talked with Jennifer for about an hour on this wonderful Internet radio show that merges creativity, expression and spiritual topics. 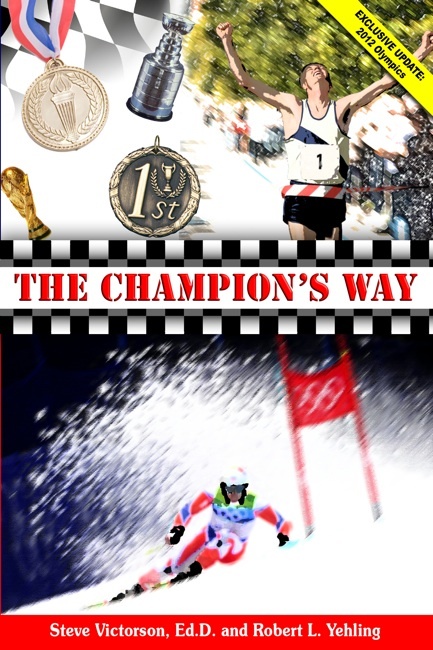 I discussed my newest books, The Champion’s Way that I co-wrote with Dr. Steve Victorson, and my novel, Voices, that will be out later in 2013. I also talked about the writing process, and how vital it is to submit well-edited manuscripts, whether you have a publishing contract or are self-publishing. I will be addressing this topic directly at the Southern California Writers Conference. Martha spoke about her memoir, A Taste of Eternity, concerning her near-death experiences and how she has repurposed her life to align more closely to what she experienced, and to share those with others. She’s currently shopping the book to publishers, and is receiving a ton of comments and reaction to her work. Since I am helping her with the book and editing it, I’ll give you some inside information right now: It is a fabulous read, with a lot of content you haven’t seen in any other near-death memoirs. Let me put it this way: Any middle-aged woman who jumps off 50-foot cliffs into the chilly Himalayan snowmelt waters in the Ganges River to celebrate her birthday is going to be writing from a place of fearlessness. That’s what makes A Taste of Eternity so special. I’ll be interviewed on all matters writing April 26 on The Write Now! cable television show in Orange County, which is co-hosted by my partner in all things poetry, The Hummingbird Review publisher Charles Redner. Really looking forward to it. Speaking of The Hummingbird Review, we’re building the Spring 2013 issue right now, with a distinct theme: the relationship of Hollywood and literature. We have great essays and poems from some familiar names, as well as distinct new voices. Will share a preview on all the goodies very soon in this blog. 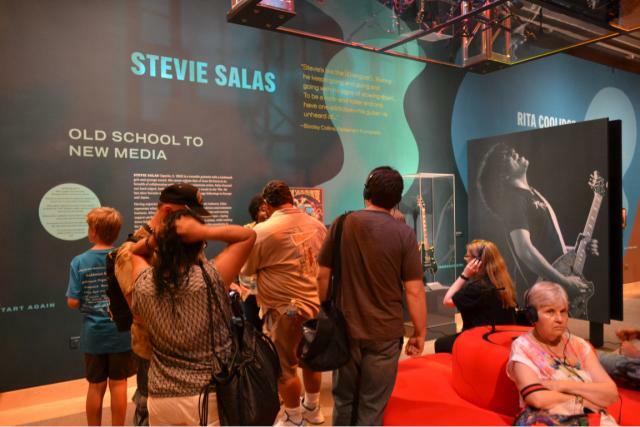 Now to switch gears for some very cool music-related news: Stevie Salas, who grew up surfing in my hometown of Carlsbad, Calif. and is considered a guitar legend in most parts of the world, recently received one of the greatest honors you can imagine. He was named the contemporary music advisor to the Smithsonian Institution. To give you some perspective, the poetry consultant is Billy Collins, who formerly served as the Poet Laureate of the United States – a position appointed by the President. Years ago, Stevie played with This Kids, a great North San Diego County cover band. Then he moved to LA and, after some tough times, he made it – big-time. 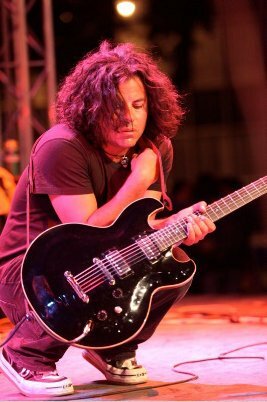 About 20 years ago, he played guitar on major world tours by Rod Stewart and Mick Jagger, among others. He has since recorded more than 20 albums, sessioned on countless others, created the Rockstar Solos mobile app that is selling off the charts, and created and served as executive producer for Arbor Live, which airs in prime time every Friday night in Canada. I don’t know of many musicians with bigger contact lists, either. Stevie keeps talking about his “six degrees of separation” from every noteworthy musician of the last 30 years, but when he starts talking about it, you realize there are really only one or two degrees. We’ll have another announcement concerning Stevie very soon. It’s going to be a good one, and it has to do with a book! 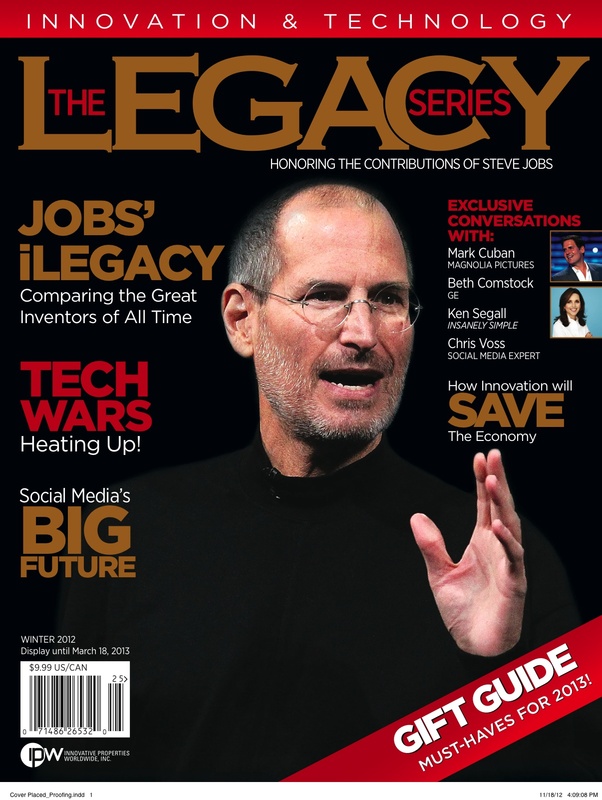 The technology/innovation/creative business magazine that I edit, The Legacy Series Magazine, made a huge splash at Macworld/iWorld in San Francisco last weekend. In addition to thousands of magazines being given away, the magazine booth was among the most crowded at the massive show. What a labor of love, this magazine: to talk with the top innovators, movers and shakers on a variety of very current topics. Among many other topics, we focus a lot on social media and publishing, as well as the devices, apps and other technology that support it. One of my personal thrills was to interview former high school classmate David Warthen, who co-founded the AskJeeves search engine (which later became Ask.com) that revolutionized search. But the best news of all concerns the magazine’s expansion. In 2013, The Legacy Series Magazine is moving to a quarterly digital format, with the final issue of the year, a larger-sized issue, releasing on newsstands nationally as a print magazine as well. Will keep you posted. 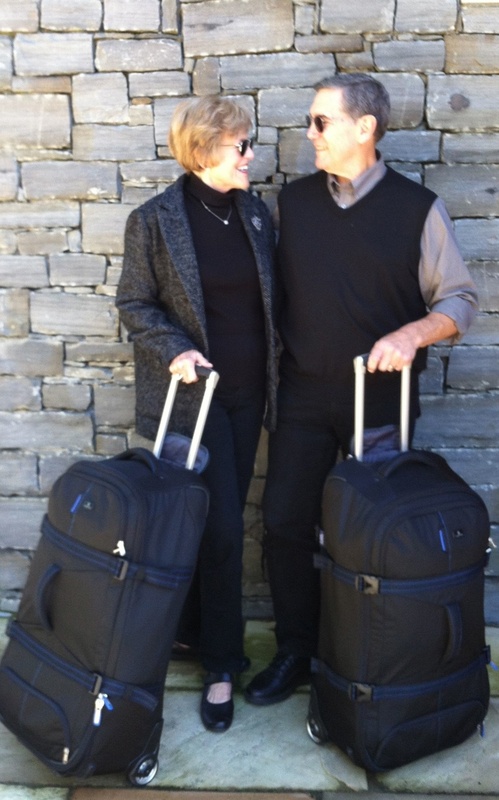 Finally, a very happy bon voyage to Lynne and Tim Martin as they sail on the Atlantic this week to begin Year 3 of their Home Free experience. 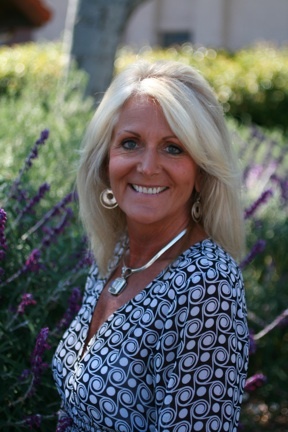 During their three-month interlude in California, Lynne sold her travel narrative, Home Free Adventures, to Sourcebooks. She’s about halfway through the draft manuscript now. As her editor, I can assure you that this fun-filled book is loaded with incredible insight that takes more than simply being a tourist to acquire. The hook is that Lynne and Tim live in each area they stop (Buenos Aires, Paris, Istanbul, Italy, Ireland, etc.) for one to three months at a time, becoming residents, not tourists. The book zips along with plenty of spice, compliments of Lynne’s keen sense of humor, love of people, and love of food. There is a backstory to this book. Five months ago, the idea didn’t even exist. A meeting in a Paris cafe with a Wall Street Journal contributor started an amazing ball rolling. Whereas some of us might have said, “Someone else probably already thought of this,” Lynne jumped on it and went from zero book writing experience to a deal — quickly. Goes to show what happens when you believe in your ideas so fully that you pour yourself into them. And then, put together an outline that can connect with large numbers of readers (and acquisition editors), and share a compelling story with plenty of personality and good information, to which readers can relate. Blog Note: Beginning Monday, October 19, we will begin posting select writing exercises from The Write Time: 366 Exercises to Fulfill Your Writing Life on our sister blog, 366writing.wordpress.com. 1) To get thoughts, feelings, observations, perceptions and experiences on paper. You never know what seeds of future stories, poems, essays, books or lessons lie within everyday words. 2) To plumb our life circumstances or situations, for both reflection and inner healing. Journals are safe havens; by writing deeply about what concerns us, we can uncover solutions, release sources of suffering and reclaim pieces of ourselves. 3) To experiment with new forms and types of writing, or to make test-runs of poems, essays and stories. Writing Universal Truths: The goal of personal, introspective writing such as memoirs, poetry and personal essays is to utilize our experiences to arrive at deeper truths, common to all. By doing so, we experience personal discovery and, perhaps, transformative moments, while also creating “familiar” moments for the readers. These are the “A-ha!” moments we experience when reading well-crafted novels, memoirs and other works. Always seek to write so deeply that you shed the veneer of your own personality and tap something much more universal, sacred, primal. With the Heart Comes Voice: What happens when we try to sing if our heart’s not into the song or the performance? Our voices tend to sound jerky, constricted. The same with good writing. Try to write not so much from the mind, but from the heart. By writing with depth and feeling, we can sharpen our authentic voice, that mixture of style, rhythm, resonance and presence that is our unquestionable imprint on the printed page. Drive voice with your heart. Turn your mind into a willing servant, pulling the words and structure you need to craft the piece, but not directing it. Final note: My friend, author/editor/photographer and Cherokee language teacher Brian Wilkes, reminded me on Facebook that, in the Cherokee calendar, we are entering a most auspicious year: Noquis’equa, the Year of the Big Star. The Year of Venus. This is a year of rapid reversals and big change. Here’s to creating some big change in all our lives with a year of great writing!